No matter what his many critics say, Matt Holliday is an All-Star hitter who, barring a significant injury, will soon turn it around to get his numbers up to near his career averages: .310 batting average, 24 home runs, and 90 RBI. If there is one thing that is for certain about Matt Holliday, it is his consistency over the course of his career, so Cardinal nation should not worry too much about his hitting–after all, it is just June 3rd. Tonight is the perfect night for him to get back on track. He faces off against a pitcher he has had success against–Trevor Cahill. 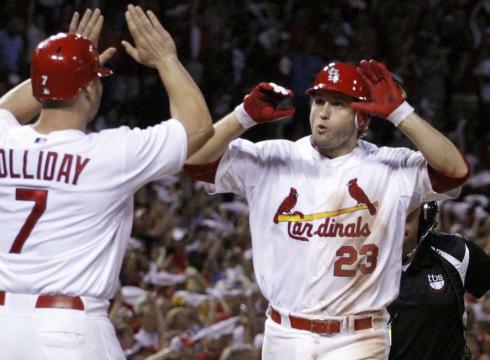 In nine at-bats against Cahill, Holliday has three hits–all for home runs. Thus, I would not be surprised to see Holliday have two extra-base hits tonight at Busch Stadium against the Arizona Diamondbacks. What to expect from Cahill in terms of pitches? According to BrooksBaseball.net, he has increased his reliance on his cutter so far in 2013–throwing it 20% of the time to left-handed hitters and 27% of the time to right-handed hitters. He also has a quality sinker that he throws around 50% of the time. Thus, he is a ground ball pitcher who has allowed only 4 home runs this season. However, as we have seen in the past with sinker-cutter pitchers, it just takes one pitch up in the zone for a player of Holliday’s caliber to deposit it into the outfield bleachers. Thus, Trevor Cahill knows that Matt Holliday likes hitting against him, and I am sure Matt Holliday was delighted to see that Trevor Cahill was scheduled to pitch tonight. It is the perfect time for Holliday to get his bat going to not only silence his many critics but to join in on the fun that the Cardinals offense has been having as of late. David Freese, who is finally seeing the ball well, looks to extend his 12 game hitting streak tonight. He has had a .357 batting average during the streak which has raised his season average to .256. Matt Carpenter, looking to stay hot in the top spot, brings an 11 game hitting streak into the game as well. Lance Lynn toes the rubber in hopes of improving on his 7-1 record. This entry was posted in Matt Holliday, Trevor Cahill and tagged Arizona Diamondbacks, Matt Holliday, St. Louis Cardinals, Trevor Cahill by stlcupofjoe. Bookmark the permalink.